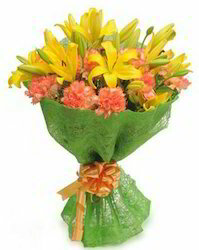 Hand bunch of 6 yellow asiatic lilies and 10 dual shades orange carnations with green fillers in jute packing. Lilies are symbolic of unions, partnerships, and long lasting relationships. 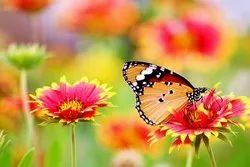 Flowers play diverse role in human life representing a unique meaning of emotions. High quality fresh imported flower arrangement. Send this mesmerizing hand tied bunch of Red Roses, to take your loved one's breath away and make it a memorable day for him/her. It’s downpour of heart-felt wishes with this exotic bunch of red and white assorted 8 asiatic lilies and 8 red gerbera flowers sitting gracefully in a charming vase, capable of creating smiles and filling heart with sheer joy. The brightest birthday bouquet full of brilliantly colored flowers. Arrangement includes red carnations, yellow chrysanthemums, pink roses and more.